I’ve been focusing on Open Digital Badges for a while now.. Was hoping for a pause to pursue an interest in exploring the other two but that just hasn’t happened yet. My plan? Introduce you to Open Badges, evoke some comments on the topic, forward a draft on how we could proceed next, solicit your opinions on this, make the necessary revisions to that plan, and (in the interests of “connectivism”) see where we might go next. These sessions will be recorded, and like all of our other MOOC resources, freely available for reuse and remix under a Creative Commons license. 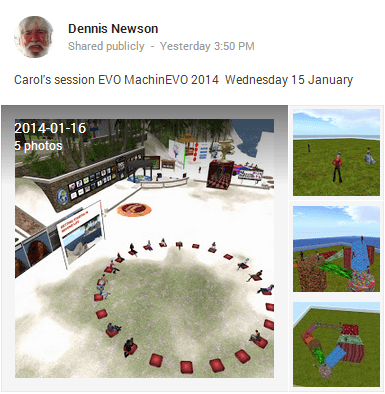 This event occurred at the end of the first week of EVO, Electronic Village Online, Jan 12-Feb 16, 2014. Accordingly, there were numerous online events the previous week which we were following on Learning2gether and MultiMOOC. Shelly Terrell will show how to use Google HangOuts to provide collaborative peer feedback to a Google Doc. She will also demonstrate how to add apps and use scripts to amplify your Google Drive. talking about setting up a mentor course and how learning about mentoring has impacted the professional life of the participants. Too often, iPads are viewed solely as consumption devices – good for little more than checking email and online research. However, in schools around the world, teachers are proving this theory wrong. Join Richard Wells (@iPadWells) and Paul Hamilton (@PaulHamilton8), as well as EdTechTeacher’s Shawn McCusker and Beth Holland, as they explore how iPads can inspire creativity and empower students to become creators of their own learning. Teachers Teaching Teachers Studio and Chat hosted weekly by EdTechTalk, a collaborative open webcasting community. 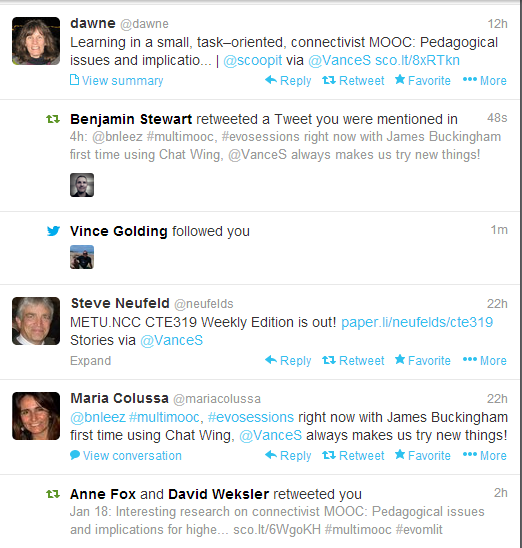 The second Twitter chat for the DIgital Curation MOOC is on Thursday 16th January at 9pm UK time. 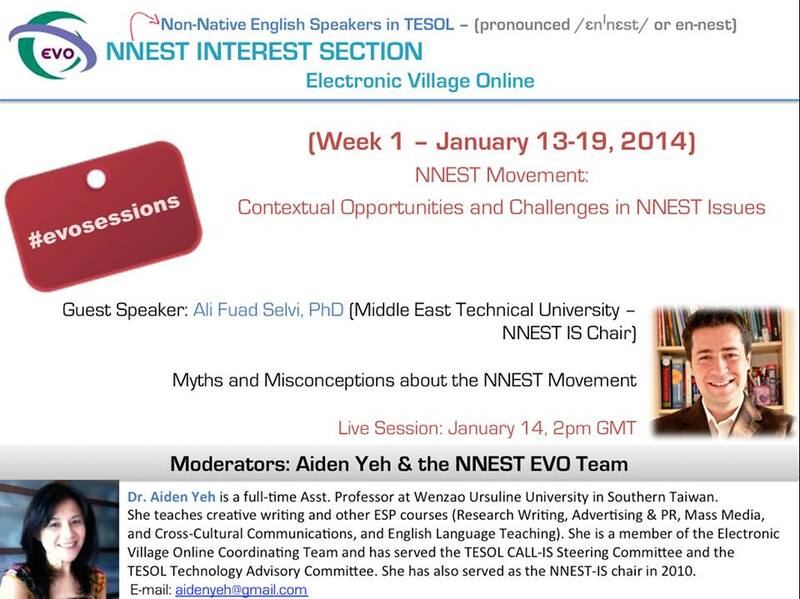 Fri Jan 17 1300 GMT EVO14: Why CLIL now? CR20 LIVE Weekly Show – EduClipper and EduTecher Updates with Adam Bellow, Classroom 2.0 LIVE is an opportunity to gather with other member of the community in regular “live” web meetings. Special thanks for this go to our sponsor, Blackboard Collaborate, for providing the service that allows us to do this! Adam Bellow returning to provide us with information and updates on his amazing web tools and apps: eduClipper and eduTecher! This is a presentation you won’t want to miss! Adam Bellow is the Founder and President of eduTecher and eduClipper, free web tools that help students and teachers discover the best resources to enhance learning in and out of the classroom. Adam was invited to be the closing keynote speaker for the ISTE 2013 Conference in San Antonio and with his speech “Change the World” kept the crowd in the palm of his hand with a presentation infused with energy, humor and optimism receiving a rousing, standing ovation from all of us in the audience. He shared his passion for how technology can transform teaching and learning to make a difference in students’ lives. He is a co-author with Steve Dembo of “Untangling the Web: 20 Tools to Power Up Your Teaching,” a book available both as both a print version and an interactive ebook that features 20 web sites and tools with teaching tips and an online community to connect with other educators. Classroom 2.0 LIVE is an opportunity to gather with other member of the community in regular “live” web meetings. 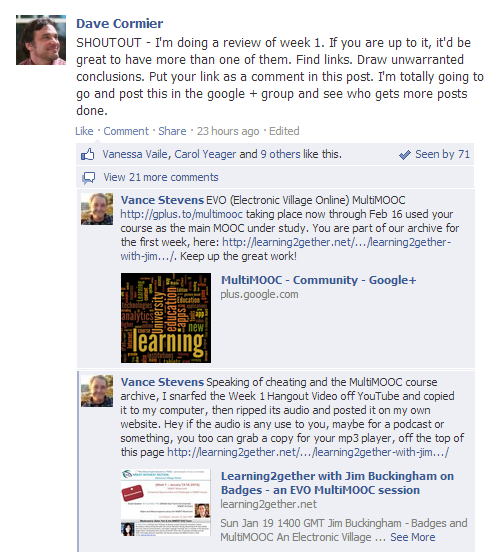 Special thanks for this go to our sponsor, Blackboard Collaborate, for providing the service that allows us to do this! Details to join the webinar: http://live.classroom20.com Follow us on Twitter: #liveclass20 Thanks so much for being a part of this community!